Some cities really do have it all—food, culture, adventure, and more—with no two travelers having the exact same experience depending on what they travel for. 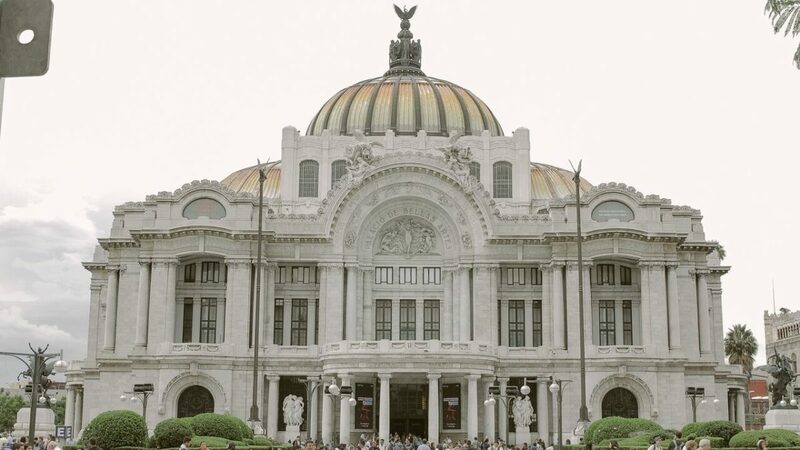 Here, we’ve given you a starter guide to Mexico City based on the type of traveler you are: whether you travel for wellness, style, business, arts & culture, adventure, or a mix of them all. Still technically inside of Mexico City, you’d never know it when you’re at this hotel. Located in the beautiful mountains that surround the city, the cabin-like quarters provide a rustic but chic respite from the busy metropolis while not being prohibitively far from it either. The hotel offers bonfires, horseback riding, hiking, and mountain biking. A luxury boutique hotel, Las Alcobas is ideally located near many of the city’s most important museums and right alongside Bosque Chapultepec—the city’s enormous public park. The hotel offers a spa with treatments inspired by Mexico’s pre-hispanic traditions, using local ingredients like agave and an eggnog called rompope to give the experience a uniquely Mexican twist. Coyoacan and San Miguel Chapultepec are both safe and beautiful, with a wealth of tree-lined side streets where you can actually find some quiet (which comes at a premium in Mexico City). Located just far enough away from the action to be on the calmer side (although central Coyoacan can get pretty busy on weekends), they’ll still be close to most everything on your list. Go here for vegan lunch classics. The Roma location’s whimsical, Gaudi-inspired building alone makes the trip worth it. A vegetarian restaurant attached to a health shop, this special place offers vegetarians a traditional Mexican take on lunch with a lush secret garden to eat in. This place is super affordable and off the regular tourist track. The surrounding area is a lovely and characteristic Mexico City residential patch. This health food grocery store chain with locations all around Mexico City opened a restaurant on the gorgeous, tree-lined Boulevard Mazatlan. The menu is a midpoint between Mexico City and Brooklyn, and the street-side outdoor seating is lovely. Way before margaritas, there was pulque. Pulque, a pre-hispanic alcoholic beverage, is made of fermented agave sap. Unlike margaritas, it’s actually extremely healthy, offering up a hefty dose of probiotics as well as vitamins B2, C, and even protein. Try La Hija de Los Apaches, a classic spot owned by a famous retired boxer, which has the classic as well as many cured flavors. Or try La Nuclear, a small hipster bar with a few flavors and some really insane murals. Stop at any juice stand you see on the street or in a market (they use filtered water! ), and order a jugo verde (green juice). With a base of either orange or grapefruit, it also has cactus, celery, parsley, spinach, and is sweetened up with some pineapple. 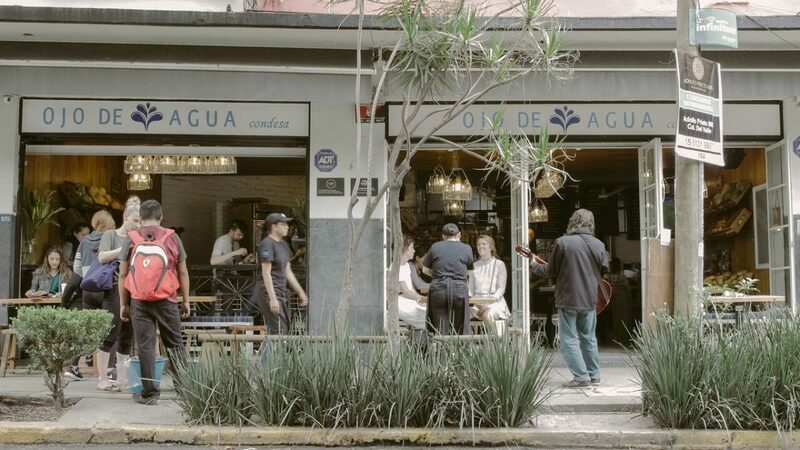 A brick and mortar option is Ojo de Agua near Parque Mexico. If you want the street food stand experience without the meat grease, try the vegan taco stand that has been on the corner of Manzanillo and Coahuila in La Roma for years. The pre-hispanic sweat lodges once used for post-battle cleansing and child birthing (called temescal) are making a comeback. You can find an upscale temescal at the W Hotel spa right in the city, or go for a more traditional experience at La Planta Medica (call for reservations and make sure to take a walk around the gorgeous surrounding area with 16th-century bridges over a long-gone river). Or if you want to spend a whole day, check out Hostal de la Luz, one of the particularly nice spas with temescals and a view in the nearby tiny mountain city of Tepoztlan, which is about an hour and a half away and famous for its wellness resorts. If you want to learn to cook vegan Mexican food with a local vegan chef, Anima Lux provides both personal cooking lessons and group workshops. Vegan tamale courses, which are three to four hours long, are especially popular with tourists. The “audiorama” is a bit difficult to explain—there are no existing nouns for this kind of delightful public amenity. It’s a garden tucked away, almost hidden in a corner of Bosque Chapultepec—Mexico City’s enormous central park—where you can go to relax. Classical music plays through speakers. There are free books you can borrow, though most are in Spanish. The brightly colored, modern benches are more comfortable than they look. There’s no talking allowed in the garden, making it a rare space of peace and quiet in the city. Ojo de Agua is a healthy food spot with fresh fruits and veggies. Photo by Timothy Shivers. With minimal, modern design and a wealth of natural materials, Hotel Carlota is an Instagram dream. With an outdoor pool, a restaurant/bar with a terrace, and a lounge with a library, you’ll barely want to leave. It’s located in Juarez, which is a prime location conveniently between the historic center, the trendy neighborhoods, and the museums you’ll probably want to hit. Plus, it’s pet friendly. An eco-friendly boutique B&B in a beautiful refurbished nineteenth century mansion, Patio 77 is halfway between a hotel and Airbnb experience, offering housekeeping but also self-serve laundry. 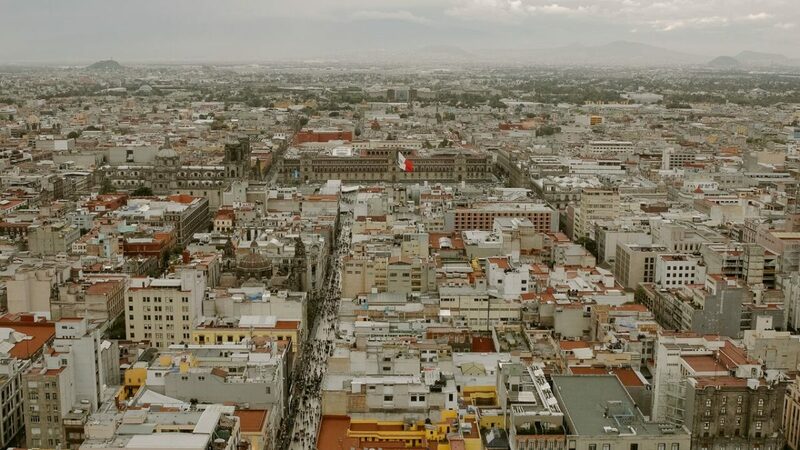 It’s in San Rafael which is not the heart of trendiness but rather an up-and-coming area a bit off the beaten tourist path and full of what Mexico City does best: grand, ornate, rundown architecture. By far Mexico City’s most famous restaurant, Pujol was named the 13th best restaurant in the world in 2018. Make your reservations as far in advance as possible. The modernist but ultimately traditional taco tasting menu, Taco Omakase, has been a huge hit locally as well as among tourists. Mexican and Indian food is not the most obvious mashup in the world, but it might be the most delicious. The New York Times called it “capital’s most inventive new restaurant,” and it lives up to the praise. In the mornings they sell what might be the best donuts in all of India and Mexico. Lardo’s sunny, beautifully-designed space and locally sourced food are equally impeccable. For dinner, make a reservation as far ahead of time as possible. For breakfast, showing up early will do, or else expect a long wait, especially on weekends. But it’s worth it. Think classics-done-to-perfection with unexpected Mexican flavors. Check out the locally-inspired creations of Mexico City’s most beloved fashion designer, Carla Fernandez, at one of her boutiques. You can find the handwork of artisans from every part of the country at Mercado Ciudadela, and curated antiques and local designs at the Cabo Verde showroom or Tamarindo Guayaba. Handmade boots that cost less than $40 among other leather goods can be found in the stretch of western clothing shops along Eje 1, a few blocks on either side of Garibaldi. There’s also the endless antiques at the massive Lagunilla flea market on Sundays. M N Roy and Departamento are two late-night spots to go to and appreciate Mexico City’s very alive electronic dance music scene. Check out the Museo del Juguete Antiguo—Museum of Old Toys, from a Japanese man who moved to Mexico after WWII started a toy collection. The museum contains about 10 percent of the collection and is open Mondays when many other museums are not. Contramar in Mexico City. Photo by Timothy Shivers. The bread basket at Contramar. Photo by Timothy Shivers. If you’re in the city for business, there’s a high chance you will end up working in the corporate area of Polanco. Head here if you’re looking for something in the area to mix up the vibe. It’s a standard, mid-upscale hotel in the terms of amenities. The draw is the building itself, a fantastical modernist masterpiece created by one of the founders of Mexican modernism, Ricardo Legorreta, for the 1968 Olympics. Business travelers might also find themselves in Santa Fe, which is a bit far from everything you’d likely want to be doing in Mexico City. It’s extremely corporate, and depressingly hard to walk around. If you’re stuck there, Distrito Capital is a boutique hotel that will give you the best of Mexican modernist, minimalist design. Many rooms have panoramic views, so at least you won’t feel too secluded. If you’re not limited to Polanco or Santa Fe and want to stay somewhere that will help you sneak a little vacation into the margins of your business trip, look for apartments in Juarez or Roma Norte. Both are safe and beautiful, and located in the geographic center of the general spread of tourist attractions. 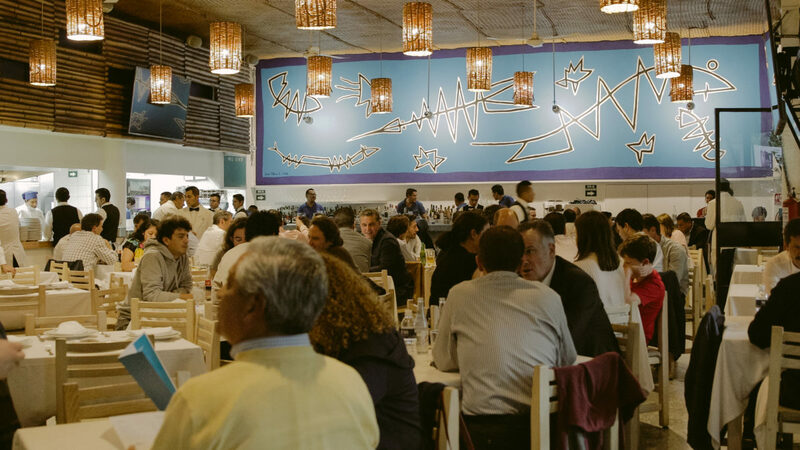 The perfect place to have a very long (and maybe boozy) lunch meeting, Contramar was called “the freshest seafood in Mexico City” by Bon Appétit. The seafood there is, indeed, perfect. It’s a lunch place, but traditional Mexican lunches can take many hours, and while lines may be around the block, nobody will give you a hairy eyeball for occupying a table for a good long while. 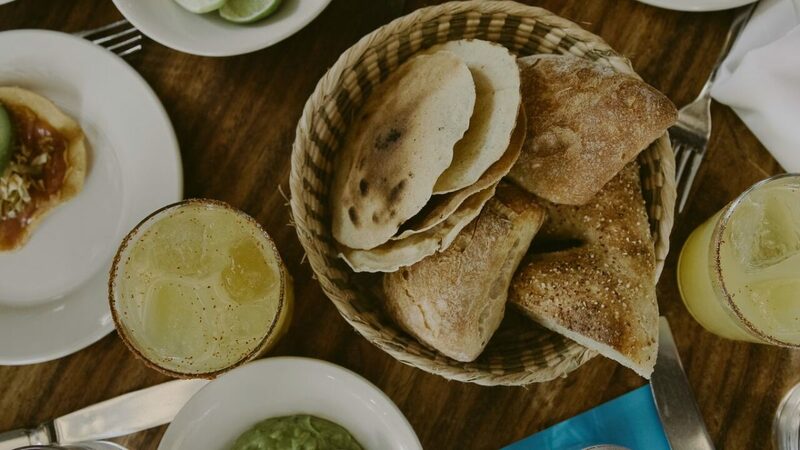 They are most famous for their tuna tostadas and carajillos, a cocktail popular in Mexico City that’s made with espresso and coffee liqueur. Reservations are recommended, especially for weekends. Jorge Vallejo, the former chef de cuisine at Pujol (maybe Mexico’s most famous restaurant), broke off to start Quintonil in Polanco, which now ranks as #11 out of the 50 best restaurants in the world. They deserve the title. With an on-sight garden in which they grow their own produce, Quintonil serves traditional Mexican with a modern twist. Reservations must be made as far in advance as possible. If you’re stuck in Santa Fe, there aren’t that many acclaimed food options. Quattro, located inside the JW Marriott, may not have the acclaim of critics, but it’s a people’s favorite, serving standard but well-executed Italian food. 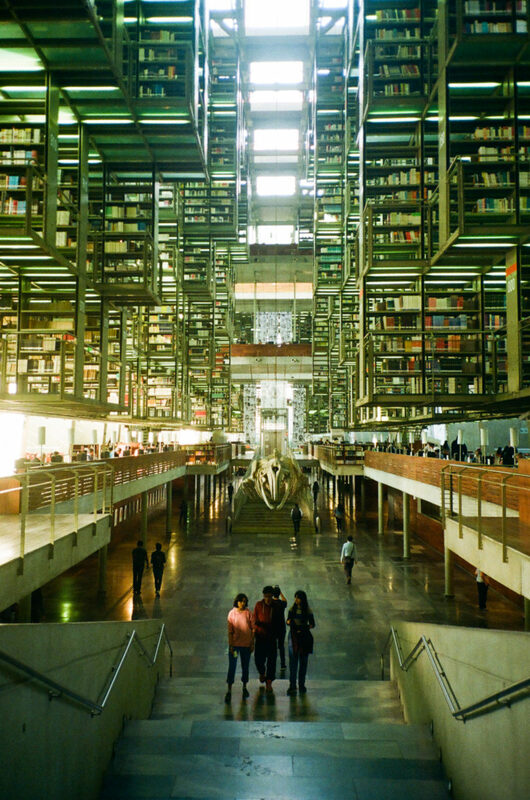 If you want a quiet place to sit down and and get work done, try the Biblioteca Vasconcelos. It’s a surreal, upside-down library where the shelves hang from the ceiling rather than sit on the floor, and it was designed by star Mexican architect Alberto Kalach. Get a crash course in Mexican history and see a stunning amount of pre-hispanic artifacts in one of the greatest architectural gems of Mexico City: Museo Nacional de Antropologia. Hit the museum’s cafe for a blast-from-the-past, wood-paneled diner experience. Every Friday night at 8 p.m., Arena Mexico hosts Lucha Libre—the famous, performative, costumed boxing matches. It’s easiest to show up and buy tickets at the ticket windows, and worth it to buy the best tickets available. It’s a loud, stinky, sticky environment, but it’s a lot of absurd, light hearted fun and there are gems to be found in the merchandise stands outside. Plus, it’s one of the few things in Mexico City that starts relatively early. Club San Luis is open with live salsa and cumbia almost all night, seven nights a week. It’s a portal to the 70s, with deliciously retro campy interiors and ficheras—women you can pay for a dance, which they make seem so effortless that they look bored. Both the music and the old-fashioned table service are classic to perfection. Biblioteca de Mexico. Photo by Chona Kasinger. This boutique hotel is located right on Amsterdam—a circular street with a verdant walking path—on Parque México, the beautiful park at the center of Condesa. The hotel’s classic old art deco architecture, characteristic of the area, is complemented by new, 100% local designs. The whole hotel is something of a showroom as all of the furniture and decorations are purchasable. The roof terrace is also excellent. Just blocks from the Zócalo—the city’s main plaza—this gorgeous 17th-century estate has been restored and outfitted with minimalist Mexican design. The rooftop pool and terrace are among the most lovely in the city. High brick ceilings and big windows make the rooms feel spacious and open. Coyoacan, San Miguel Chapultepec, and Roma Norte are all safe, beautiful neighborhoods centrally located for someone seeking out the Frida-Diego Trail (see below), galleries, and museums. This independent movie theater has both excellent programming and food. Go weekend mornings for brunch, nights for a mezcal, and all week for films, talks, and other film-related events. Come for the food, stay for the murals. Spread across three floors of an old mansion, this restaurant serves super classic Mexican food—which does not just mean tacos. They’re famous for breakfast but open all day. If you’re visiting the Luis Barragan House, the Kurimanzutto gallery, or traveling from any of the many museums in Bosque Chapultepec back to Roma or Condesa, stop by the Hare Krishna temple in San Miguel Chapultepec for a surprisingly huge, delicious, and cheap (less than $5) vegetarian, Indian-inspired meal that you almost certainly won’t be able to finish, including bread made fresh on site. The Frida Museum, or Casa Azul, is touristy and packed but an absolute must. Definitely buy tickets ahead of time online, and get there a few minutes before it opens to avoid what can otherwise be hour-long lines. Diego Rivera’s studio by Juan O’ Gorman is a poorly curated museum but an incredible building—one that would go on to influence Mexican modernism heavily; plus, it’s still cool to see where Rivera painted. Museo Anahuacalli is a looming, volcanic rock, temple-like structure that Rivera and O’Gorman built together, and it houses Rivera’s personal collection of pre-hispanic sculptures, plus the sketch plans for some of his most famous murals. Don’t miss the view of the city from the roof. Catch more Diego murals in the Palacio Nacional, the Secretaría de Educación Pública (only open 9 a.m. to 3 p.m.), and a huge private collection of his paintings along with Khalo’s in the Dolores Olmedo Museum. Mexico City’s modern art scene has exploded in the last few years. Some of the most salient galleries are: Lulu, Lodos, OMR, and Kurimanzuto. Check their websites to find out what’s on. Mexico City has the most museums of any city in the world. The Jumex is a modern art museum designed by David Chipperfield. Next door is the Soumaya—well known and beloved for its Instagrammable architecture, but widely derided for the way it displays art. Other worthwhile art museums: The Tamayo, Bellas Artes, the Modern Art Museum. Palacio de Bellas Artes. Photo by Timothy Shivers. This B&B is right on Amsterdam, the lush green circular walking path street that circles Condesa, next to a precious little roundabout with a fountain. It’s something between a hostel and a hotel. Breakfast is provided, each room has a private bathroom, and it has a great rooftop patio used for a lot of communal hang outs. Selina has rooms that range in prices from private suites to hostel-like dorms. Catered to digital nomads, it’s got co-working space, yoga, cultural programming, and a lively bar. Conveniently close to the center, it’s located in a mammoth, restored 19th-century building. Escandón and Santa María la Ribera are two safe neighborhoods with gorgeous, historic architecture. They’re like their own little towns within the sprawling metropolis, and give the feeling of being more off the beaten track without actually being far away from most of the destinations you’ll want to check out. Located right on the busy Chapultepec Avenue in Juarez, this tiny, hectic, packed place has enormous and incredibly delicious shrimp and mushroom quesadillas made with fresh tortillas. It’s best to get the quesadilla and eat it on the street right there before it gets cold or soggy. For the traveler curious about eating bugs, this place serves various classic dishes from maguey worms to ant eggs to grasshoppers. It’s really not that gross or weird. The thrill seeker may be disappointed, but those looking for a tasty new culinary experience will be pleased. If your time to explore in Mexico City is limited, but you want a chance to see all of the city’s architectural wonders, you can see them here as meticulously crafted miniatures. You’ll also get to see a recreation of Teotihuacan and other important buildings from around the world in a bizarre, endearingly campy theme park. It’s off the beaten tourist track, and the surrounding area isn’t very safe. It’s definitely worth the journey, but arriving by taxi or Uber is better than by public transit. At this market you can browse supplies for Mexican witchcraft (a mix of Santeria, Catholicism, and indigenous practices), love potions, and statues of folk saints, or get your soul cleaned for about $5. There’s a whole section of ritual herbs that smells amazing, and another for sacrificial animals that smells less amazing. The vibes are heavy, but the cultural mashup is fascinating.